Sarawak Report has received an exclusive dossier of photographs showing the full extent of the violence and anger that has broken out in the normally quiet, law-abiding communities of Tebedu, Serian. The trouble broke out a fortnight ago, as Taib’s logging raid on this valuable area of remaingin virgin jungle got under way. 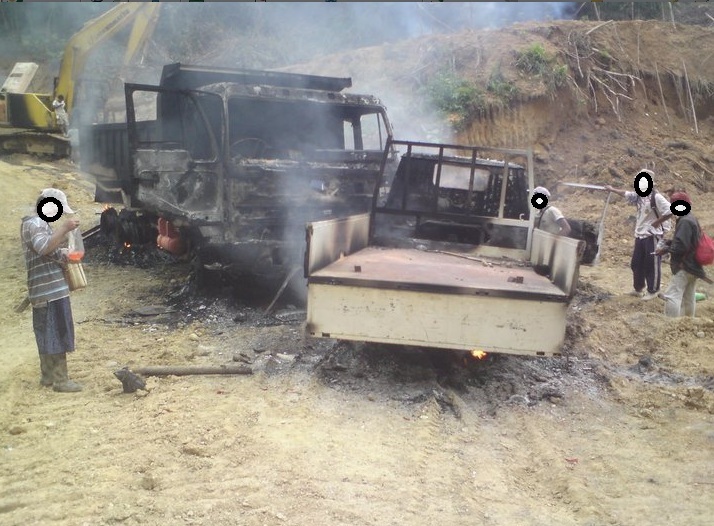 Village headmen were threatened and there was an unprecedented attack on the machinery and transportation trucks belonging to the logging company. The loggers, mostly foreign workers of course, had fled in advance. No more use out of this. 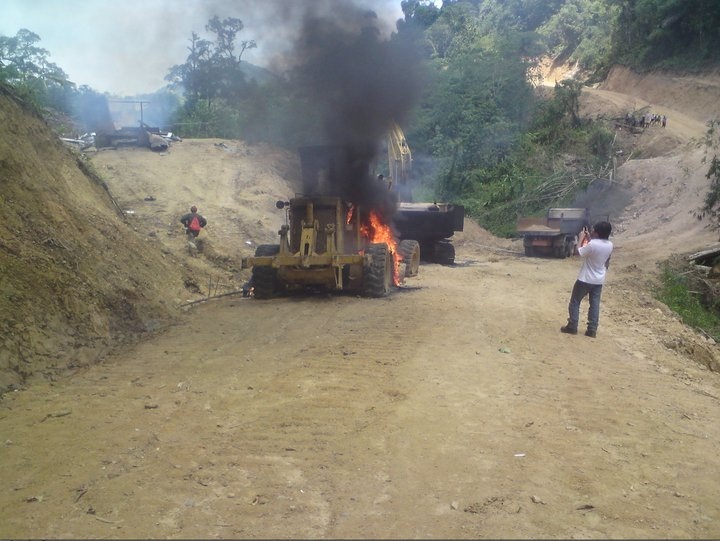 It has already been reported that this rare outbreak of resistance by the normally timid and extremely impoverished Bidayuh community resulted in the torching of 4 lorries, heavy machinery and 5 buildings for housing the foreign workers. 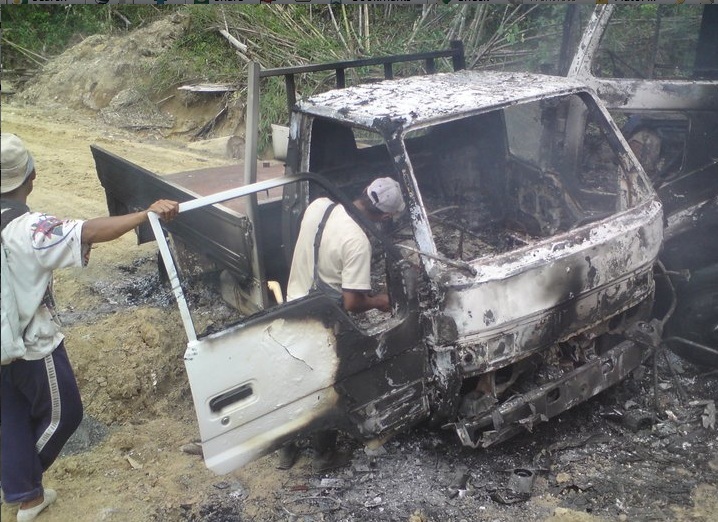 A bridge that had been used to enable the transportation of wood has also been damaged. Our pictures now reveal the extent of the destruction carried out by some 500 villagers from 10 affected longhouse communities. A representative has told Sarawak Report that the action was born out of desperation and a sense of deep anger and betrayal by a united community against what they rightfully regard as an illegal raid on their homelands and the territory they live off. “We had tried every other method to stop them, but nobody took any notice” the spokesperson explained. Indeed, over the past few months representatives from the villages have filed two police reports demanding a halt to the invasion of their native customary rights territory, which have been ignored. The communities have also written numerous letters to State and Federal authorities, which have also been unanswered. Something had to stop this mass raid on their forest. According to the villagers these letters were addressed to the Political Secretary of the Chief Minister, the Political Secretary of the Prime Minister, The State and Federal Environment Ministers, the State Director of Healthand to Michael Manyin and Richard Riot, the State and Federal representatives for the area among others. However, none of these politicians belonging to the ruling BN coalition bothered to respond. 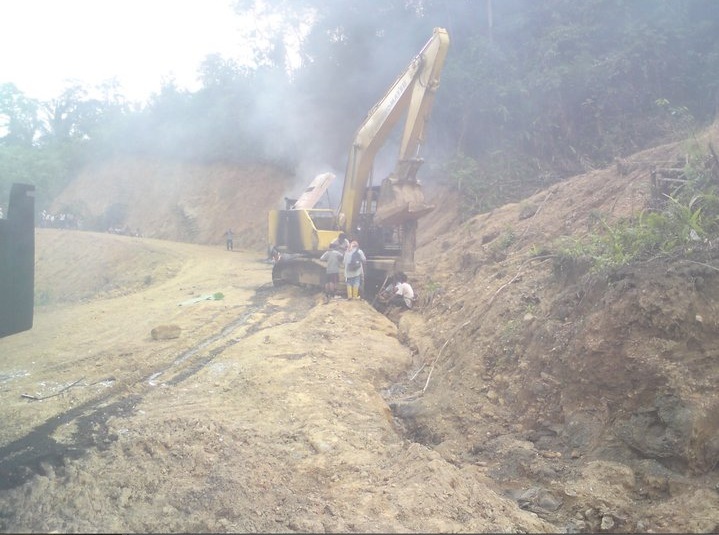 This failure to take action was in the face of a litany of justified complaints by the community, beginning with the fact that the villagers were already experiencing a pollution of their water supplies caused by the logging activity upstream. The villagers were also angry that the road, which they had originally been told was being build as ‘development’ to service their villages, had suddenly stopped hundreds of yards short of their homes and swung up instead into their forests to bring in bulldozers to plunder the wood. Surely, a government that boasts it has brought ‘development’, but has yet to provide adequate water supplies or roads to an area it is seeking to exploit in this way, should at the very least attend to complaints about its sponsored activities? Now, in a crisis entirely of the Chief Minister’s own making the situation is one of stand-off. The local police have calmed the villagers and and are said to have acted in an understanding and effective manner. However, with the logging now at a halt, it rests with the state government to decide how to handle the situation that their own negligence and greed has allowed to arise. poorly constructed logging roads cause massive mudslides and erosion. When the loggers leave these will soon be useless for the local community. Like so many of the problems in Sarawak Tebedu has been caused by Taib’s own greed. Just last month he took part in a fraudulent TV interview, showcased on a sponsored Sarawak website, in which he claimed that 70% of Sarawak’s rainforest is pristine, “preserved” and untouched! The clearly rehearsed and heavily edited performance was designed to counter the unanimous assessments by respected environmental organisations that well over 90% of the jungle has in fact been taken – it is generally agreed around 95%. The truth is that the miserly old Chief Minister cannot bear the prospect of handing over office before all such valuable areas of remaining hard wood have been mopped up and the proceeds placed in his bank accounts. Sarawak Report has already detailed the testimony of senior businessmen who have confirmed the level of bribes and kickbacks they are forced to pay the Chief Minister and the Mahmud family in return for gaining logging licences. Why should Tebedu be any different? Stopping the destruction and plunder of their lands. If polite letters and police reports and constant requests don’t work….. The 4,125 hectare area of virgin rainforest that the Minister for Resources and Planning (Abdul Taib Mahmud, in one of his many political guises) has signed off for logging in Tebedu, is a precious remnant of jungle right deep into Sarawak’s interior, reaching up to the Indonesian border. It is packed with valuable hardwood trees, such as the top quality Belian, which have now been almost entirely wiped out by Taib’s earlier logging. Such is their rarity now that, according to Dr Christopher Kiyui, the local man who ran as PKR’scandidate at the last election, this wood is therefore worth hundreds of millions of ringgit. On past evidence that means that the destruction of this area will bring half that in profits to Abdul Taib Mahmud himslef and that the local people will receive nothing except the destruction of the lands they once lived from! Taib also had the cheek in his recent TV interview to claim that all logging and development is carried out ‘sustainably’ in Sarawak! So, let us consider the process by which he has conducted a lightening raid on this rare patch of virgin jungle, which is the recognised native territory of the Bidayuh. Taib launched his move on the area in 2009 handing a timber licence on 15th October to the State body known as the Sarawak Foundation. This was set up in the 1970s to support education in the State and is now firmly under his control. The local residents were of course given no notice of the area having been selected for logging. 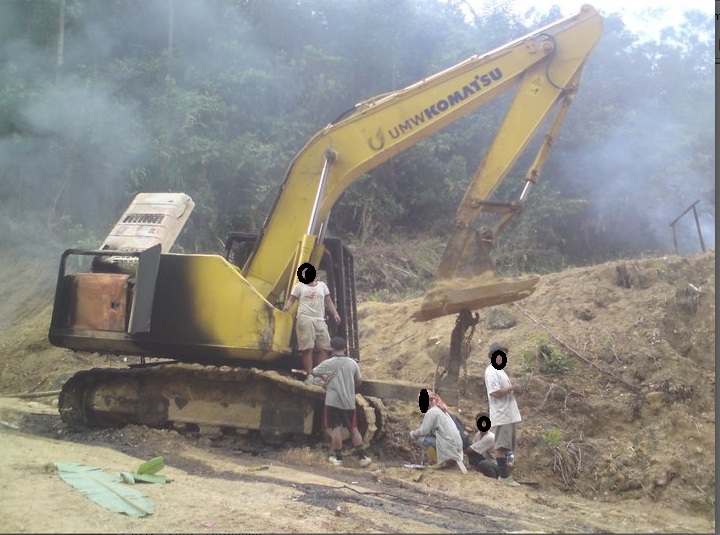 Twelve days after the timber licence was granted, 27th October 2009, a private company called Alliance Bahagia Sdn Bhd was formed by two local businessmen, Tiong Ngie Kiang and Ho Tion Soo (a hardware merchant). The company described its area of activities as “Investment Holding, General Merchants and Management Services”. 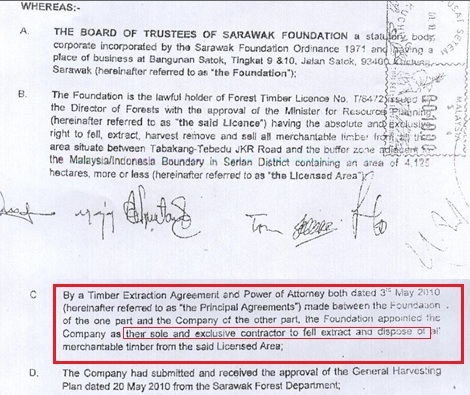 However, records show that on 3rd of May 2010 Alliance Bahagia was awarded a Timber Extraction Agreement and Power of Attorney by the Board of the Sarawak Foundation to be their “sole and exclusive contractor to fell extract and dispose of merchantable timber from the said Licenced Area”! “Sole and exclusive contractor” – but who told the local people? Sarawak Report would like to enquire what investigations had been carried out by the Board of the Sarawak Foundation and the Forestry Department into the suitability of this company to extract wood and what Environmental Impact Assessments had been carried out to ensure the ‘Sustainable Forestry” of this prime area of pristine jungle, one of the few such remaining in Sarawak? More to the point, if such assessments were made, why were they not published and opened to expert scrutiny? Even more to the point, why were the local people told nothing at all about any of this? By June 2010 the machinery of Alliance Bahagia was rolling into their area and driving through roads and tearing down trees causing water pollution and these people had been told nothing about it! Sarawak Report questions the independence of the Board of the Sarawak Foundation is this matter, given the Membership of that Board. We note that the Chairman of the Board is none other that the brother in law of the Chief Minister, Adenan Satem, who is also in his State Government as Minister of Information! The most senior board member is then listed as Mrs Jabu, wife of Taib’s loathed Deputy, Alfred Jabu, while the State Financial Secretary of Sarawak is also on the Board. In fact, practically all the members of the Board are equally either politically or personally related to Taib or depend on him for their official jobs. Cosy line-up. The Sarawak Foundation is run by his political appointees. It was not until September 2010 that the Company set about doing something about the locals. What they did has become a typical and disgraceful form of corruption under TaibMahmud, who passed legislation to end the democratic election of headmen and to replace the system with appointees, who are paid a small salary by the State. Of course everyone in Sarawak knows of this problem. It is a corruption of the democratic system by Taib (one of many he is responsible for) and it is a deeply regressive development by a man who pretends to represent a ‘progressive’ government. If someone had stolen your multi-billion ringgit forest might you be angry too? 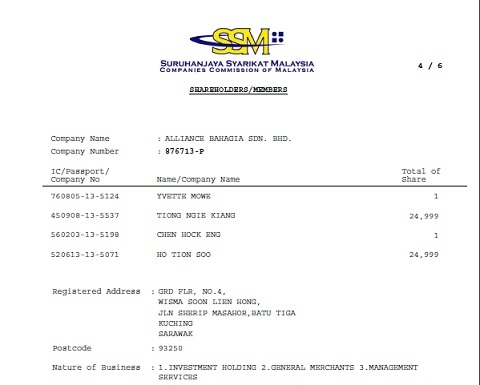 So the loggers, backed by the Sarawak Foundation, the local YB Manyin and Taib, as the Minister in charge, did a dirty back-room deal with 5 of these headmen. It was a typical deal of the sort that has deprived communities of their rights and lands and of course proper compensation the length and breadth of Sarawak. These 5 Headmen, who are all of limited education, were summoned to a meeting with representatives of the logging company and their lawyers and asked to sign an “Agreement”. They were given no warning or explanation and they were not given the opportunity to consult their villagers in advance, as is specifically their role and the custom under established laws and procedures. The “Agreement” was in English, which these men do not speak and they were not given any access to translation, legal advice or any explanation of the terms of the “Agreement” they were signing. As employees, therefore, they did as they were told under the circumstances and signed a document that, in return for what is believed to be a scandalously small sum, handed away all rights over their community’s multi-billion ringgit jungle areas. RM 50 each? and they didn’t even see it! Not so easy for the loggers to wash their hands of all responsibility as they thought? 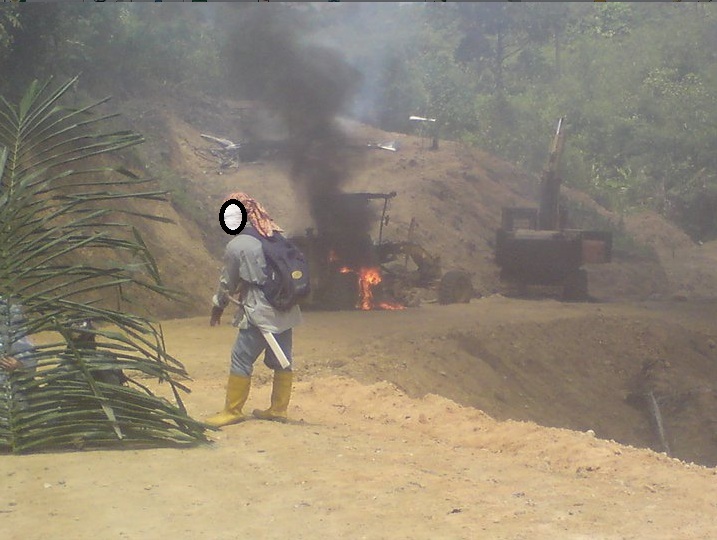 It is believed that Taib, his Sarawak Foundation and the Alliance Bahagia company paid RM50 per person in the community for this agreement to surrender all their existing and inherited rights over the land and as full compensation for any future harm or damage that might arise from the logging around them! Of course the people have not seen any of this money because it was handed to the Headmen on their behalf in a so-called “ex-gratia” payment. This outrageous and exploitative agreement, of which Sarawak Report has a copy, further makes it plain that the headmen are also taking on the full responsibility of dealing with any future complaints that the population might have as a result of the logging by the company! The company has washed its hands of dealing directly with any of such difficulties – and all for the bargain price of RM 50 per person! 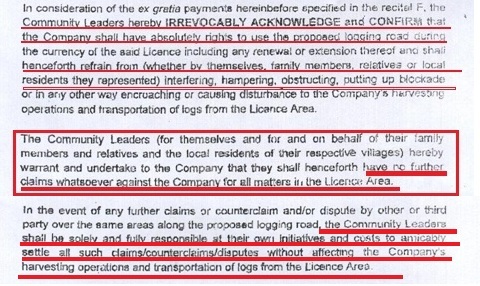 Extract from the exploitative agreement – the company washes its hands of all responsibilities and leaves the headmen to deal with any future complaints by the villagers who are still unaware of the contract! 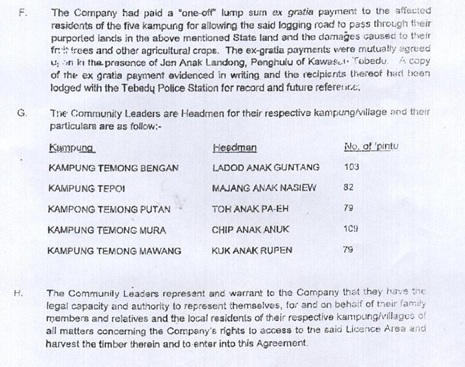 It is finally worth point out that this agreement was signed by just 5 of the headmen out of the 14 communities affected by the area of the logging licence. The other headmen were not invited, but the agreement specifies that it has been signed in the name of all the communities and acts as a full and final settlement of the issue as far as the company is concerned! The name for an agreement such as this is Plain Fraud. In any genuine court of law the persons responsible for such deception would be convicted of blatant and calculated theft and fraud and the agreement would be dismissed as null and void. How 5 Ketua Kampong secretly signed away the rights of their people. Fortunately, in this case Baru Bian, the human rights lawyer and newly elected leader of PKR in the State Assembly will be taking up the matter. He has won numerous land rights cases against the government of Abdul TaibMahmud in recent months. The Chief Minister’s reaction has been to first threaten the judges who were finding against him in accordance withthe law and then to have them removed. This is not the way to deal with justified and lawful complaints. Pushing people beyond what they can bear? Taib may get hold of the forest by these means. He even managed to win the seat for this area in the recent election. After all, the BN Candidate Michael Manyinthreatened the communities that their electricity would be cut off if they did not vote him back in! He also bribed them with two slaughtered pigs and a handout of 30,000 ringgit (a pittance compared to the value of the jungle which he is allowing to be taken from them). Just to make sure, according to Dr Kiyui, many local people under the age of 40 found that their names had disappeared from the electoral register on the day of the vote! Manyin won by 4,000 to 2,000 in this tiny rotten borough of a seat, where so many of the people have never been registered at all. However, by removing the processes of law, the opportunities for complaint and all access to justice, Taib is falling into the trap of so many dictators. 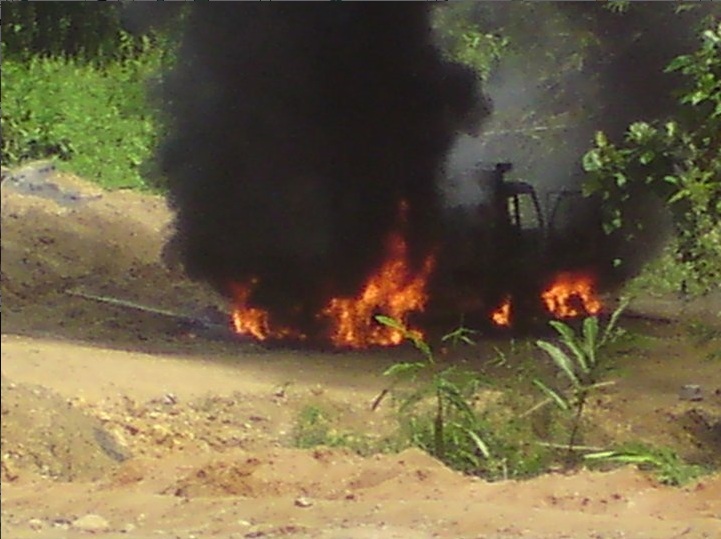 The actions of the people of Tebedu show that they have been pushed too far. Like the people of Tunisia, Egypt, Syria and Lybia they have been forced to do what they would never normally do – they have resorted to rare violence. The loggers cannot just write themselves out of responsiblity via a tacky agreement. They hold responsibility fair and square. This is what Taib pushed them to do the weekend before last: First the people threatened the Headmen, whom they had discovered had signed away their rights for money. As a result, the headmen then had to rush to the police who sent in all the local reserve forces for their protection. 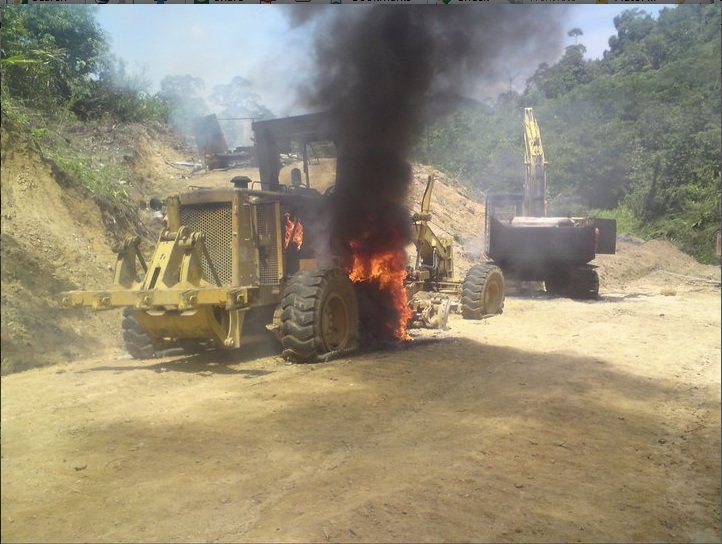 While the forces were so occupied the crowd of 500 local people went up to the machinery, which had been abandoned by the frightened foreign workers (no jobs and no money for the locals from Taib’s ‘development’ project as usual) and they torched it. What did Taib expect? Why is this insanely greedy man still running this state on which he haspersonally wreaked so much destruction out of pure personal averice? Countries across the world are beginning to ask why Malaysia does not act? LET THE FIRE OF FREEDOM FROM PLUNDER SPREAD! OPPRESSED PEOPLE ARISE! YES, it is a people’s war! The people must rise to fight for the rights and defend their land from more “aggressive development” i.e plunder. The Bidayuh villagers have initiated the new guerrilla war on the colonial plunderers. Michael Manyin and Richard Riot.What kind of YBs are you?? 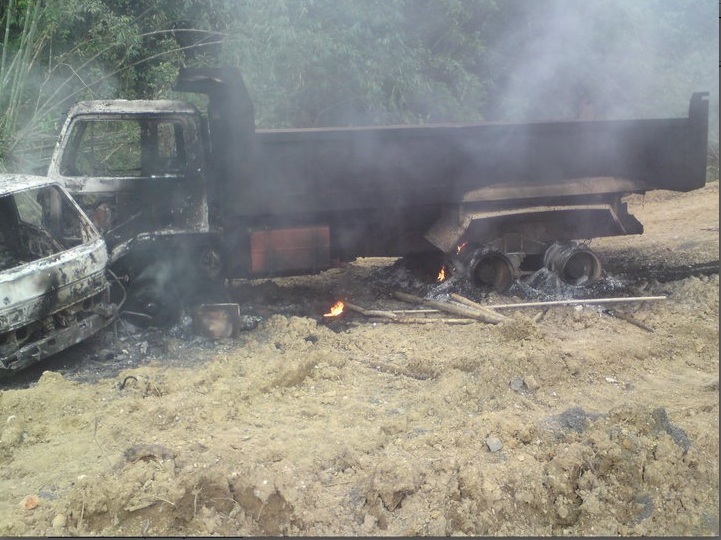 This is people’s war against logging company in Tebedu.It’s their right to defend their NCR lands.This a warning to BN YBs who don’t want listen their voices. I can only pray that these evils be wrested out sooner or later by someone clean, fair and with righteous!! Can’t bear with these evil any more!! Ah….Why Najib the colonial master? Snap out off your daze! We have been colonised for 47 over years and you cannot see this? Sarawak is not more than a colony for UMNO Malaya! Australia, Britain, American and Canada should act now to freeze Taib Mahmud and family bank accounts and assets. Will Monaco do so too? just cant believe you anymore.